They say life is short so eat dessert first. 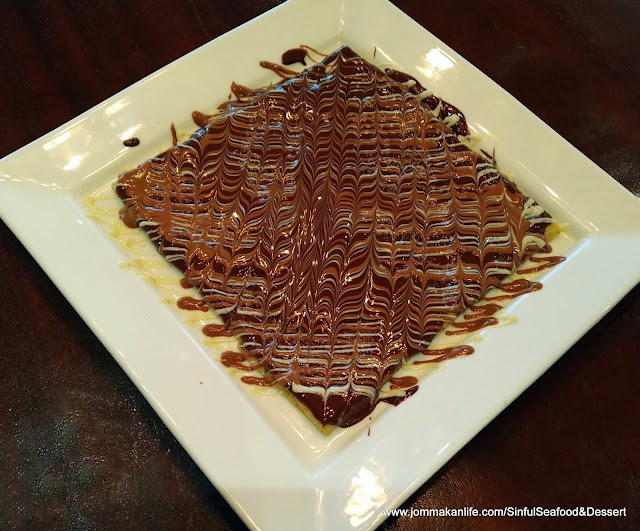 Opened in late December 2018, Sinful Seafood & Dessert aims to satisfy the hankerings of local seafood and dessert lovers in one spot. Furnished like a hipster café, Sinful’s simple and spartan interior treads the fine line between the raw industrial feel of bare concrete walls awash in warm, mellow lighting and the practical modernity of blocky wooden furnishing and dark armchair seating. 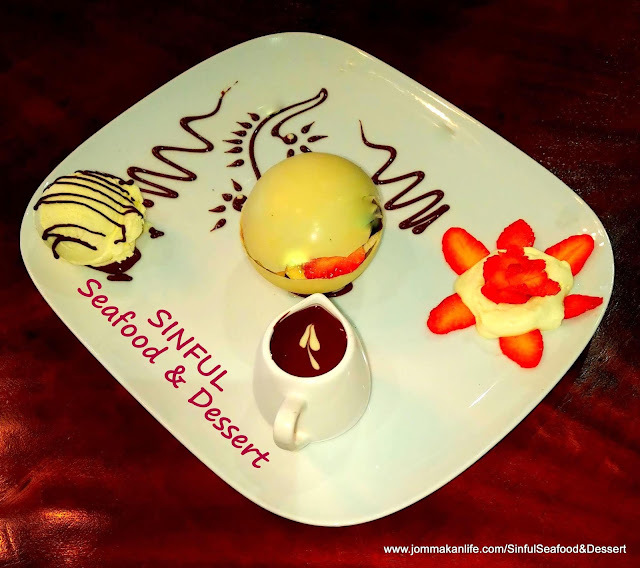 True to its name, Sinful’s straightforward menu focuses solely on seafood and dessert. 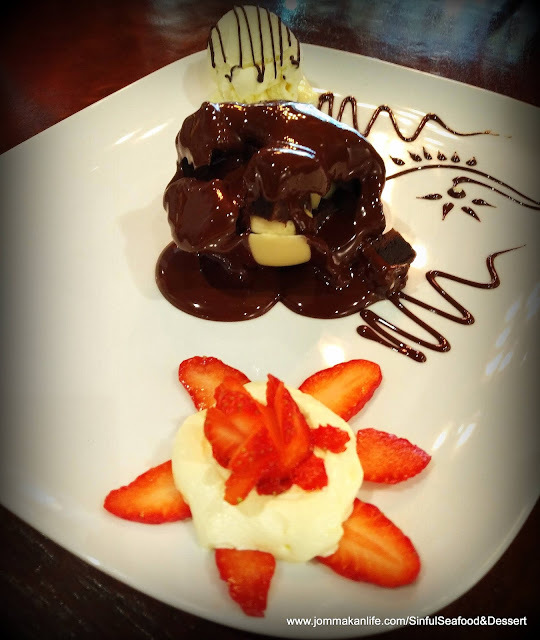 Sweet-tooth enthusiasts should get the ball rolling with the Chocolate Magic Ball (RM29.50) or the Chocolate Crepe (RM20). Both are equally sinful but heck, you only live once so go for a sweet surrender. A decadent treat no chocoholic should pass up on, the Chocolate Magic Ball is served at the tableside with some flourish. A small jug of warm chocolate is poured over the white chocolate ball — the melted chocolate dissolving the white chocolate ball before completely blanketing the dark, fudgy chocolate cake inside. We like the thoughtful touch of presenting the ultra-chocolatey treat with a mound of fresh strawberry slices and cream; the burst of tart acidity a welcome counterpoint after that rush of rich chocolatey sweetness. Somewhat lighter in texture albeit no less generous on the amount of chocolate used, Sinful’s signature Chocolate Crepe has white, milk and dark Belgian chocolate drenched over it. The top quality chocolate is silky smooth with a lingering finish, making it a heavenly pairing with the paper-thin crepe. 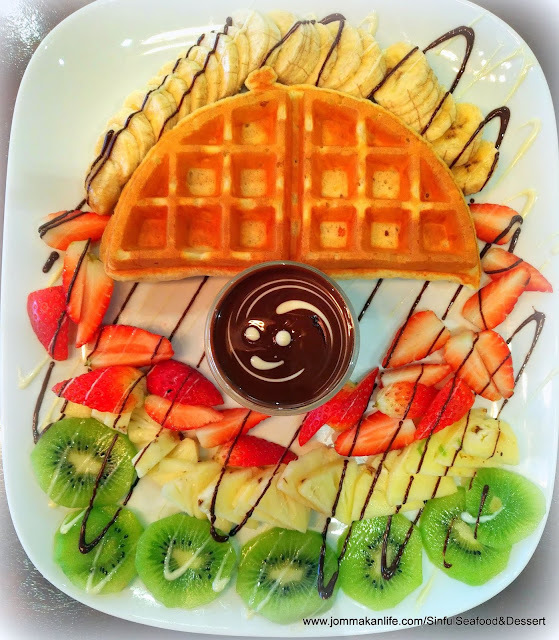 Personally, I prefer the Sinful Fruits Waffle (RM38.50). IMHO, the waffle is hefty enough for sharing. Texture-wise, it’s a light and pleasant canvas to pull the assortment of sliced banana, kiwi, strawberries, pineapple and chocolate together. 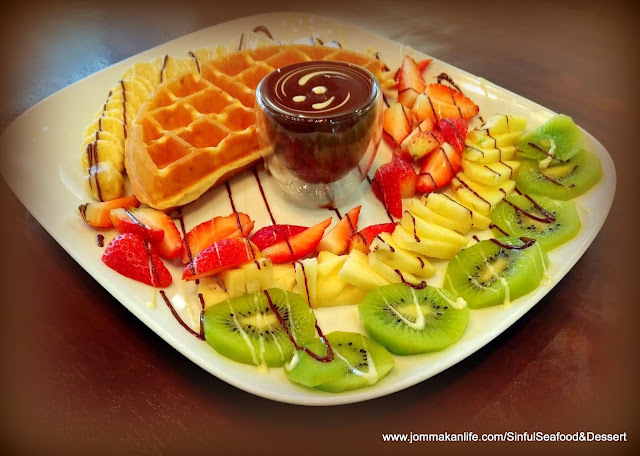 More tropical fruits make their presence felt in the Sinful Fruits Pancake (RM28.50). 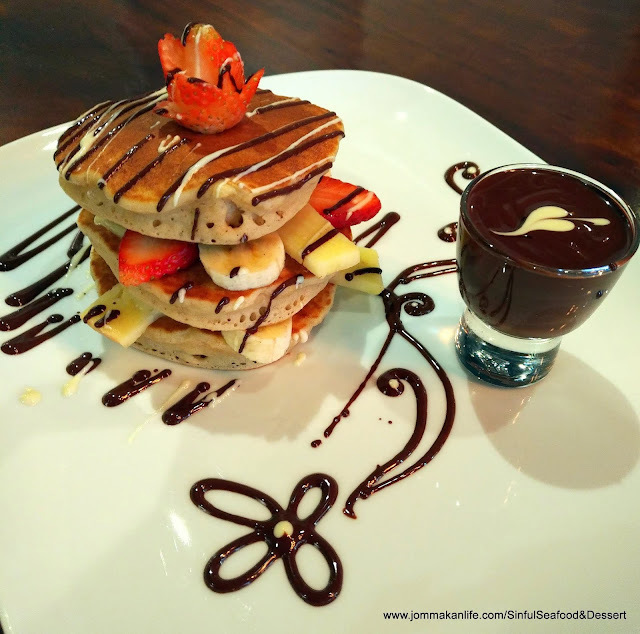 The stack of fluffy soft pancakes came up to mark, layered with chunks of tropical fruits and lashings of chocolate. A creation that’s hard to fault and guaranteed to leave you replete. Wallet-friendly Seafood Combos are the other headliners at Sinful. 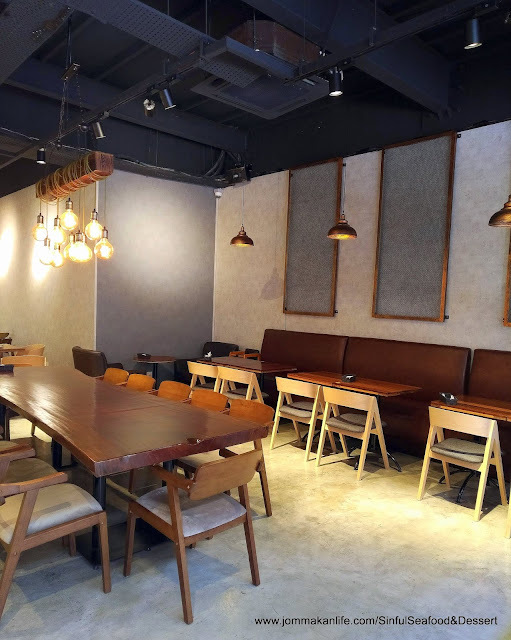 Solo and group diners are catered for so you’d find different combos available; from RM22.90 for a Single Combo (for 1 person) up to RM224.80 for a Party Combo (for 10 persons). 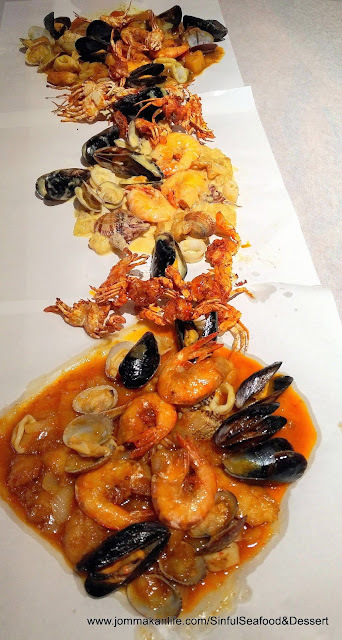 Each Seafood Combo consists of deep-fried crispy baby crabs in addition to mussels, squid, prawns, fish and clams prepared in a choice of piquant house-made sauces available: Sinful Signature, Honey Mustard, BBQ, Spicy & Sour, Garlic or Curry. Also part of the meal deal is free flow of Rice, Potatoes, Mashed Potatoes and Coleslaw. Our top vote goes to Honey Mustard — the subtle mustard zinginess works well to blunt the saucy richness whilst simultaneously enhancing the natural seafood sweetness. Coming in a close second is the Curry sauce. More delicately spiced like a Japanese curry than a local one, we find it works like a charm with the seafood; suffusing their inherent flavours with rich complexity. Savoury-sweet accents are most pronounced in the Sinful Signature sauce. Admittedly, it’s an acquired taste for me personally but some diners may find it float their boat. Give it a shot and decide for yourself since the jury is out on this one. 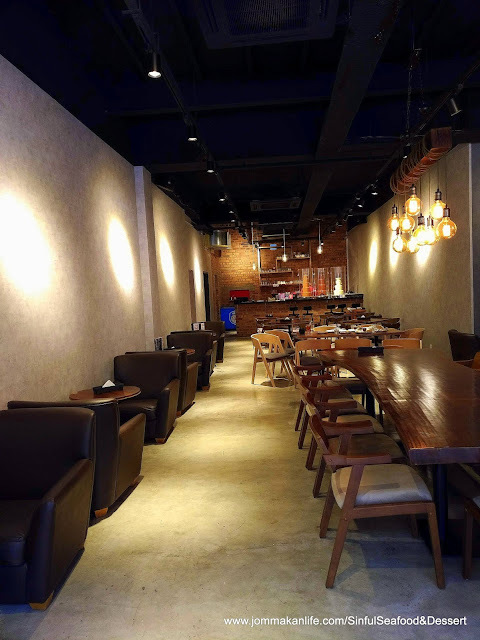 If you’re working in the vicinity, Sinful offers a wallet-friendly Single Set Lunch at only RM14. 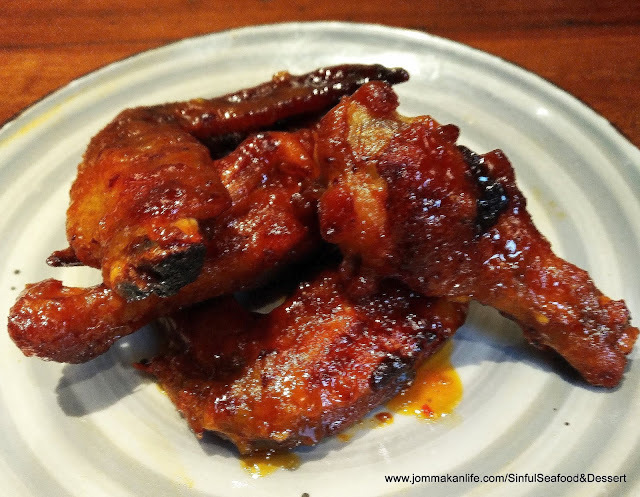 Choose from Seafood (with a choice of Curry or Sour-Spicy Sauce) or Chicken Wings accompanied with Rice & Egg and a complimentary drink. 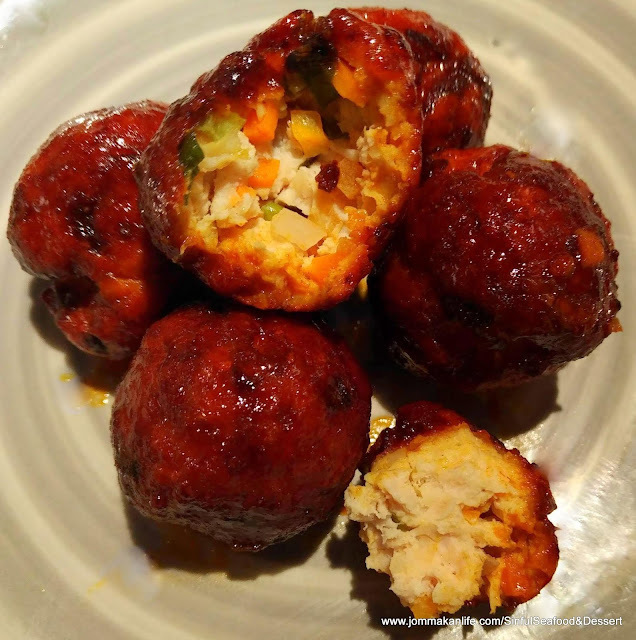 Delectable snacks to stave off hunger pangs while you wait include Chicken Wings (RM10.90, 6pcs) and Chicken Balls (RM10, 8pcs). Both are freshly cooked to order so you can be assured the crowd-pleasers are notable enough to make waiting time bearable or work up the appetite before succumbing to the main attractions. 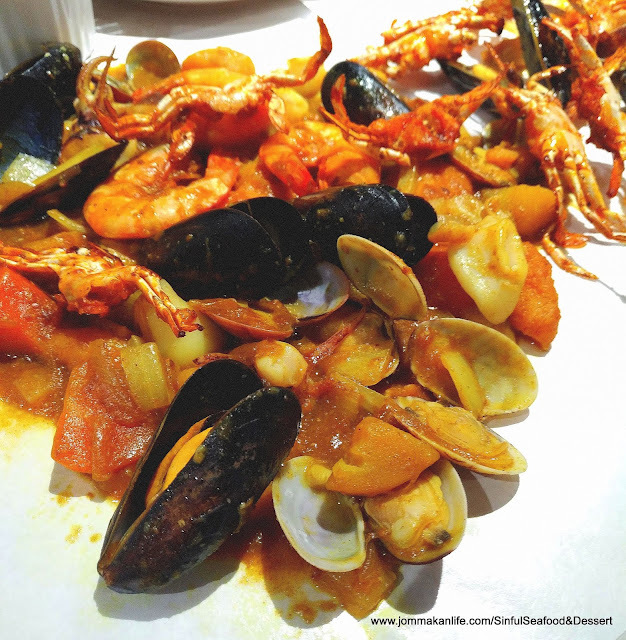 For reservations, please call Sinful Seafood & Dessert, tel: 03-2780 7336 or 016-2205 713. Address: Block Hutton, G-3A, Plaza Arkadia, Jalan Intisari Perdana, Desa Park City, Kuala Lumpur.